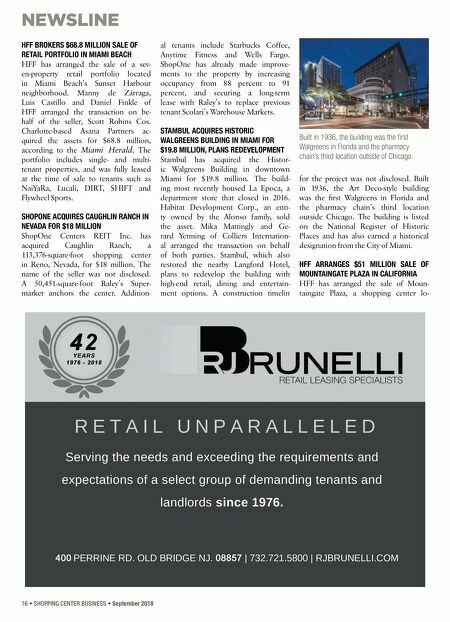 16 • SHOPPING CENTER BUSINESS • September 2018 NEWSLINE HFF BROKERS $68.8 MILLION SALE OF RETAIL PORTFOLIO IN MIAMI BEACH HFF has arranged the sale of a sev- en-property retail portfolio located in Miami Beach's Sunset Harbour neighborhood. Manny de Zárraga, Luis Castillo and Daniel Finkle of HFF arranged the transaction on be- half of the seller, Scott Robins Cos. Charlotte-based Asana Partners ac- quired the assets for $68.8 million, according to the Miami Herald. 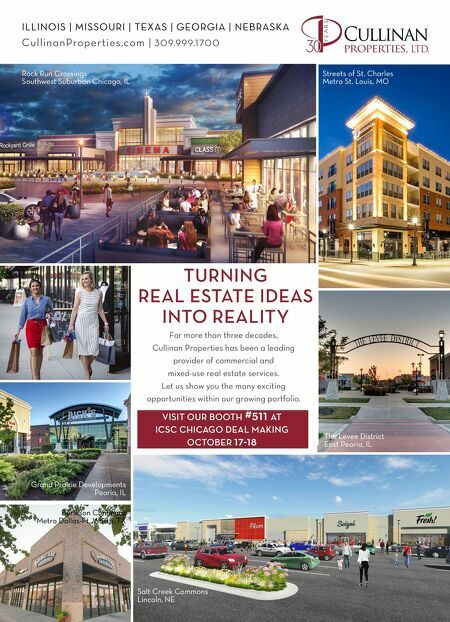 The portfolio includes single- and multi- tenant properties, and was fully leased at the time of sale to tenants such as NaiYaRa, Lucali, DIRT, SHIFT and Flywheel Sports. SHOPONE ACQUIRES CAUGHLIN RANCH IN NEVADA FOR $18 MILLION ShopOne Centers REIT Inc. has acquired Caughlin Ranch, a 113,376-square-foot shopping center in Reno, Nevada, for $18 million. The name of the seller was not disclosed. A 50,451-square-foot Raley's Super- market anchors the center. Addition- al tenants include Starbucks Coffee, Anytime Fitness and Wells Fargo. ShopOne has already made improve- ments to the property by increasing occupancy from 88 percent to 91 percent, and securing a long-term lease with Raley's to replace previous tenant Scolari's Warehouse Markets. STAMBUL ACQUIRES HISTORIC WALGREENS BUILDING IN MIAMI FOR $19.8 MILLION, PLANS REDEVELOPMENT Stambul has acquired the Histor- ic Walgreens Building in downtown Miami for $19.8 million. The build- ing most recently housed La Epoca, a department store that closed in 2016. Habitat Development Corp., an enti- ty owned by the Alonso family, sold the asset. Mika Mattingly and Ge- rard Yetming of Colliers Internation- al arranged the transaction on behalf of both parties. Stambul, which also restored the nearby Langford Hotel, plans to redevelop the building with high-end retail, dining and entertain- ment options. A construction timelin for the project was not disclosed. Built in 1936, the Art Deco-style building was the first Walgreens in Florida and the pharmacy chain's third location outside Chicago. The building is listed on the National Register of Historic Places and has also earned a historical designation from the City of Miami. HFF ARRANGES $51 MILLION SALE OF MOUNTAINGATE PLAZA IN CALIFORNIA HFF has arranged the sale of Moun- taingate Plaza, a shopping center lo- Built in 1936, the building was the first Walgreens in Florida and the pharmacy chain's third location outside of Chicago.